Are kits getting bigger, or is it just my imagination? Or is there a good reason for sheer size? Well, here is a 1:6 scale vehicle that can lay claim to commonsense, for the Dragon SAS 4x4 Desert Raider Jeep is to the same scale as many popular military figures, such as GI Joe and Action Man, and also many of Dragon’s own superbly detailed military figures. This Jeep is not the first biggie from Hong Kong-based Dragon either - others include German vehicles, the Kubelwagen, Schwimmwagen, and Pz Kpfw II AusfB tank. 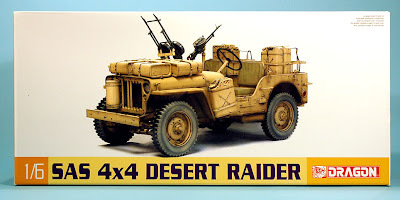 The Dragon Jeep has already been made in a US Army version, this latest being a British SAS desert-equipped machine. The kit has over 370 parts, which for the size of kit is not really so many (especially when compared with truly complex kits, such as the 2500-component Dora rail gun) and because of the size, the Jeep not all that complex to build. The parts are moulded in light grey, which means applying a straightforward desert tan shade, then weathering as much as you like. As well as plastic parts, there are peel-off decals for the instruments, and a few other labels. There’s also flexible ribbon supplied, to make straps for ammo cans, and a solid metal axle for the rear wheels. The complete chassis, four-wheel drive system and transfer boxes are featured, but oddly enough there’s no separate engine supplied. Luckily, this is not obvious unless you view the finished vehicle from directly underneath. A pity though, as it would be a good subject for a down and dirty spanner-and-toolkit maintenance diorama. Still, the sheer size makes it a tempting build, and it’s certainly a kit for the to-do pile in the - hopefully - not too distant future. Keep an eye open for my build update. 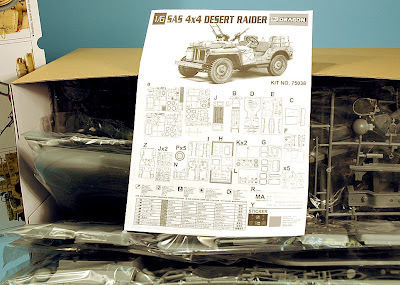 Kit supplied courtesy Dragon’s UK importer and distributor, The Hobby Company.